The building blocks for autonomous cars are already here, but so far the biggest step into that world for actual consumers has been Tesla’s Autopilot. Now General Motors is going there too with a semiautonomous highway driving feature called Super Cruise, available on the new Cadillac CT6. Questions about how it stacks up to Autopilot will be endless, so I’ll get this out of the way first: Super Cruise is not quite as capable as Autopilot, but it’s objectively safer. Trust me, I know. I recently spent a dozen hours driving across four states in a new CT6, with most of time spent on the highway, the only domain for Super Cruise. By safer, to be clear, it’s a minor take. Super Cruise is like having a high school teacher sitting in front of you, telling to keep your eyes forward throughout class. Look away for a moment, and a red line starts blinking in your face. With Autopilot, which I spent a couple dozen hours with this summer, the safety warnings that ask a driver to resume control of the wheel are prevalent, but I quickly found I was able to frequently wander and gaze about the road without issue. With Super Cruise, I quickly realized I had to look ahead no matter what. So, Super Cruise is not so much an answer to Autopilot as much as it’s a helpful driving companion that’ll help familiarize consumers with the technology and illustrate the benefits that come from autonomous tech. Most drivers are generally weirded out about autonomous driving features—at least for now—and one of the simplest ways to help familiarize people with the technology is through baby steps. And that’s what Super Cruise is: a tip-toe along the path toward full autonomy. That’s not to understate the significance of what Super Cruise accomplishes, and GM knows it’s something to champion. The automaker has, over the last several weeks, sent a Cadillac team on a coast-to-coast trip to show off the new CT6. I don’t want to belabor the Tesla comparisons, but the tech-heavy CT6 should make for a stellar competitor to the Model S if you find yourself buying a car purely for the driver aids. A Super Cruise-equipped CT6 with the Premium Luxury Trim starts at $71,300, a few thousand dollars shy of what’s now the cheapest Model S.
That’s all fine on paper; here’s what Super Cruise is like on the road. 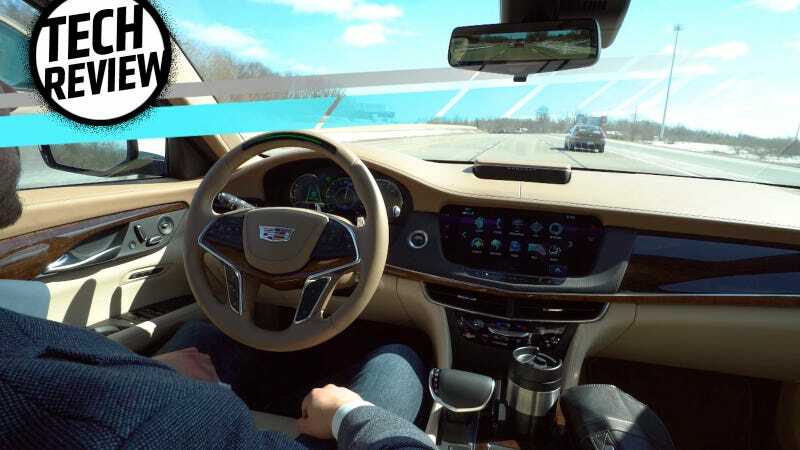 Cadillac’s proudly calling Super Cruise the first “true hands-free” driving feature on the road today—and that’s one way it differentiates from from competitors. Tesla’s Autopilot and others require drivers to shimmy the steering wheel a tad to signal they’re still paying attention. That little camera is always keeping an eye on you. That’s one aspect where Super Cruise sets itself apart. To make it work, Cadillac engineers plopped a face-detection camera along the top of the steering wheel that’s always monitoring your face. The system can only be deployed where GM says it’s OK: that is, on divided, limited-access highways, with defined on and off-ramps. And you have to be square in the middle of the road to turn on the feature before it can be activated. Along with a suite of cameras and sensors, Super Cruise relies on and incorporates LiDAR mapping data; the company says it has mapped every highway mile of U.S. and Canada—160,000 in total—to ensure the system’s primed to work. Any construction projects can be imputed to the system by GM, so Super Cruise is prevented from being activated in those relevant areas. A high-precision GPS system notifies the car where it’s at within two meters. Super Cruise sounds like a hyper-intense version of cruise control, and while it’s a refined, far-more advanced iteration, it’s still eminently practical and timid. That’s because is has a number of limitations. When that simple dance is complete, a green icon lights up on the dash, and with the press of a button, the car takes over. Unlike Autopilot, Super Cruise maxes out at 85 mph. On the second day of our journey, I managed to find a glitch, seemingly by chance. The way the system’s designed to work, after Super Cruise is engaged, you’re only supposed to be able to press the + key to increase speed to 85. From there, you can hit the throttle—but as soon as the car reaches 92 mph, Super Cruise is supposed to engage. During one stretch of the day, when no other car was around on the highway, I wanted to confirm that was the case. I managed to lock in a speed of 95 mph, and the CT6 hit that speed before I relented and brought it back down. (Any ticket was on me after all.) Later, I tried again and locked in a speed at 105 mph. When I asked Cadillac about this, I initially received nothing short of puzzlement. That prompted Robb Bolio, Cadillac’s vehicle performance manger who was involved in the Super Cruise project, to conduct some extra tests, and indeed a glitch was discovered. That didn’t exactly explain what happened to me, but the vehicles we tested were preproduction models, and Bolio said there’s no safety issue presented by the glitch. And Cadillac said they’re actively working to finesse the software. “We’ll work through it,” Bolio said. And changing lanes, really, isn’t that much of a heavy lift. When Super Cruise is engaged, a green line appears atop the steering wheel; when you’re ready to switch lanes, the line turns blue. As soon as you’re centered in the adjacent lane, a green line reappears, signifying the car’s back in control. Is Super Cruise better than Autopilot? Depends on what you want. Bolio’s reasoning about not implementing automatic lane changes echoes Cadillac’s emphasis on delivering an extra-safe, but reliable, semi-autonomous system to customers. Throughout two days of driving, I kept trying to trick the Super Cruise steering wheel camera, but even peering downward could set off the warning system. Sunglasses, known to be problematic for face-scanning tech, were no match for the camera, either. I could check a text, maybe, but I was more or less resigned to enjoying the view directly in front of me. And that’s OK! GM has been working on Super Cruise for a long time, and with automakers pouring billions into developing self-driving technology, it’s no surprise that a sudden crush of vehicles are set to have semi-automated features. Is Super Cruise better than Autopilot? Depends on what you want, I suppose. Tesla recommends only using the Autosteer function on highways with a center divide and clear lane markings; as I quickly realized over the summer, though it can be used in off-highway environments, it’s not ideal whatsoever. But in the recommended highway scenario, Autopilot was just as relaxing and comfortable to use as Super Cruise. Personally, I prefer the auto-lane change function; that seems like a feature that’s entirely subjective, though. Both make long-distance treks far easier to handle. When you can accept—and it’s definitely hard—that the car’s capable of handling most of the highway driving, so long as you’re paying attention, you’ll find that lengthy drives aren’t so tiresome. Many of us who love to drive are concerned what place we’ll have as technology like this becomes more common. But even if you love driving, I see the advantages in helping with some of the most boring and monotonous aspects of operating a car, like endlessly long freeway drives. The CT6 is a fun and powerful machine. Giving the driver some aid on long road trips doesn’t take away from that. Also, being that this is GM—inherently a much larger company than Tesla—it’s not hard to imagine the tech will trickle down into other models soon. (They haven’t said yet, for the record.) So Super Cruise and its variants could very well be most people’s first real experience with semi-autonomous cars, rather than the tech-forward first adopters who tend to go for Teslas. Where GM succeeded here is that Super Cruise worked as it was marketed, besides the small glitch I found. In an environment where many are still skeptical or slowly becoming accustomed to autonomous tech, that’s a good thing. I can’t say how many customers Cadillac will win over because of the system, but it shows that GM’s serious about having a stake in an automotive future that cedes more control to automation.